121 min. Warner Bros. Pictures Distribution. Director: Clint Eastwood. Cast: Clint Eastwood, Charlie Sheen, Raul Julia, Sonia Braga, Tom Skerritt. The Rookie will go down in the Hollywood history books as the one in which Clint Eastwood gets raped—or his character gets raped. It can be hard to tell the difference. Okay, there's little doubt that Eastwood's character Nick Pulovski, a grizzled cop, gets raped by the evil moll (Sonia Braga) of a murderous car thief. As the story goes, what happened to Eastwood himself was a mostly consensual, though coerced transaction. In exchange for bankrolling Eastwood's uncommercial longtime pet project White Hunter, Black Heart, Eastwood would make The Rookie, a popcorn action picture cranked through the cliché machine. In fact, The Rookie was originally to be a Dirty Harry sequel, which shows in the actor-director's stock portrayal of his own wry, brash, urban archetype. The film's inciting event is the murder of LAPD Detective Pulovski's partner by Strom (Raul Julia), the German "businessman" in charge of a car-theft ring. To exact his own brand of revenge, Pulovski will work independently of the force, reorienting his by-the-book rookie partner David Ackerman (Charlie Sheen) all the while. Pulovski is a cigar-smoking, divorced ex-racer (another excuse for the film's chubby for driving machines), while Ackerman, raised with a silver spoon in his mouth and nagged by the traumatic childhood loss of his brother, rebels against his low-tolerance father (Tom Skerritt). Ackerman doesn't know it yet, but he's ready for some rage therapy, which Pulovski is more than willing to stoke in his uptight partner. Eventually, Ackerman goes rogue (in a flurry of bad acting on Sheen's part), joining Pulovski in the wanton destruction of the movie's second half. On a pure trash level, The Rookie has its moments, all of them stunts—indeed, the movie is notorious for having over twice as many stunt performers as actors. It goes without saying that the movie is trigger-happy, but it's downright comical the way these cops discharge their weapons at the drop of a hat (well, I'm guessing Pulovski doesn't do paperwork, anyway). More impressive are the vehicular stunts, though they tend to the cartoonish. 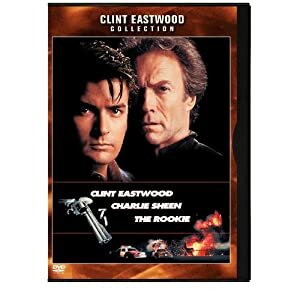 The Rookie's best sequence is its intital car chase, in which Eastwood pursues (and boards) the car thieves' semi auto-carrier, but matters get downight nutty by the picture's midsection—in which Pulovski is kidnapped by the baddies: his escape involves a sports car shooting out of a second-story wall, just ahead of an explosion ("Fasten your seatbelt," Pulovski sez). Later, the action moves to the airport (actually, the San Jose International Airport) for some big-scale action on the runway (watch out for that plane!) and a shootout in the terminal. As long as things are going "boom," the picture is mildly diverting, but the wholly generic characters disappoint. The Rookie commits the cardinal sin of making Raul Julia boring (other than the contemplation of how this guy—and this accent—comes to be German), and utterly wastes Lara Flynn Boyle (the year she hit with Twin Peaks) in the thankless role of Sheen's girlfriend. Eastwood and screenwriters Boaz Yakin & Scott Spiegel sloppily telegraph plot developments, and most everything about that plot is brazenly illogical, beginning with the cop killing that sets the entire plot into motion. The motivation of the bad guy should be a minimum requirement for an action picture, but nothing Strom does makes any sense; given that, the filmmakers should at least imply that he is crazy, which they don't. Completing the picture of screenwriting obnoxiousness, The Rookie obnoxiously rhymes earlier scenes to later ones for lame attempts at "callback" humor or—what's that called?—structure. Just make something go "boom" again, thanks. 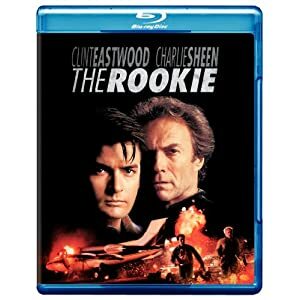 Released by Warner as part of a major wave of Clint Eastwood titles, The Rookie makes its high-def debut in a reasonably good-looking transfer that's a clear upgrade over the DVD. The image here mostly just falls down in shadow detail, which is a significant issue for a film with as many low-light scenes as this one; this is not going to be a disc to show off your home theater, but it's a natural transfer that looks pretty much as one would remember the film looking in 1990, grain and all. The DTS-HD Master Audio 5.1 mix is likewise workmanlike; The Rookie will doubtless never sound better than this, and though the rear channels don't get much of a workout, it's certainly an adequate presentation. The sole bonus feature, not surprisingly, is the film's "Theatrical Trailer" (2:02, SD); this one's for inveterate action junkies and Eastwood completists, who will be glad to shelve it with the rest of the director's prolific output (much of it already on Blu-ray). All site content © 2000-2019 Peter Canavese. Page generated at 04/18/2019 04:48:25AM.